In this “Kitchen Spotlight” post, we’ll move South and take a look at a favorite staple: Okra. 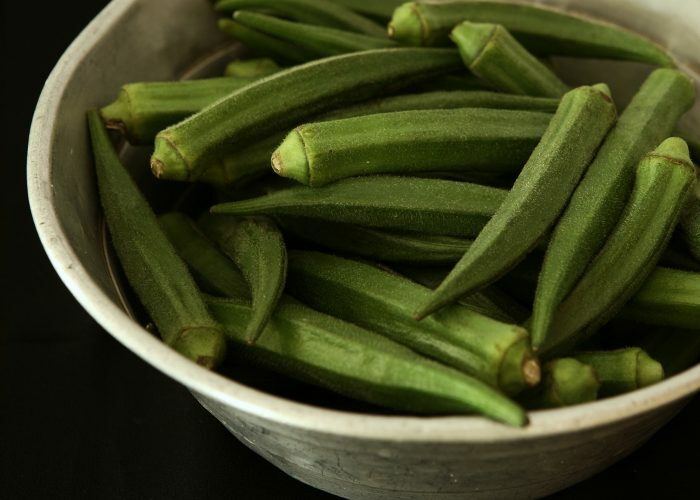 Usually recognized by its green exterior, and sticky or slimy texture when cooked, few are aware that okra can come in red and purple colors as well. It is native to Africa, and there are nearly 20 different varieties of this vegetable. One cup of raw okra (100 grams in weight) is composed of nearly 90 percent water, but a decent amount of fiber (3.2 grams), potassium (299 milligrams), some iron (0.62 milligrams), as well as small amounts of B vitamins, and the vitamins C, K, A and E. One cup of raw okra actually contains as much calcium (82 milligrams) as about 2 ½ cups of raw spinach (30 grams in weight)! When cooked, it is a good low carbohydrate choice suitable for those with diabetes, because a half cup of sliced boiled okra without salt (80 grams in weight) only yields 3.6 grams of carbohydrate. When boiled and drained, okra still provides approximately 2 grams of fiber, 62 milligrams of calcium, 0.22 milligrams of iron along with small amounts of the other nutrients. Okra also contains the antioxidants lutein and zeaxanthin. Since most of the fiber in okra is soluble fiber, it is comparable to beans, barley, oats and apples in terms of health benefits. Defrost frozen sliced or whole okra, then roll in cornmeal before baking. If frozen, okra can remain frozen in the freezer for up to 24 months. Enjoy experimenting with this vegetable! Nussinow J. Okra. Food & Nutrition Magazine, July/August 2013 Edition.